Phillip Hughes and Ricky Ponting made amends for modest first-innings returns with polished half-centuries, but Australia's optimism was somewhat tempered by a shaky middle-order display against Sussex's slow bowlers. Ollie Rayner, a giant of a finger spinner at 6ft 5in, and the rookie Will Beer exploited the slow Hove pitch to claim a combined four wickets that will not have escaped the attention of messers Swann, Panesar and Rashid. By stumps on day three, the Australians had positioned themselves for victory at 379 (dec) for 7, holding an overall lead of 417, but the tourist's second innings was not without its flaws. With spin bowling looming as the hot-button issue of the summer, the Australians will have hoped for better against the likes of Rayner and Beer, although the performances of Hughes, Ponting and, later in the day, Michael Clarke went some way to papering over the cracks. Hughes' Bradman-esque stint with Middlesex earlier this summer attracted countless headlines, and the rookie opener gave every indication more were to come with a solid 78 from 127 deliveries. 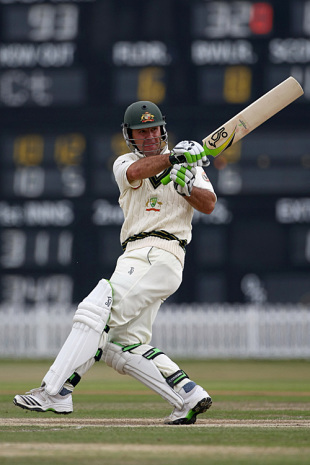 Combining for a 93-run opening stand with Simon Katich (40), Hughes showed more restraint than in his sparkle-and-fade effort in the first innings on a testing batting surface. As ever, his unorthodox technique proved a major talking point. Hughes' penchant for creating room outside off-stump opened many run-scoring opportunities, but it also led to his downfall - bowled by Pepler Sandri for the second time in the match - after the lunch break. "That was a few weeks ago now," said Hughes of his Middlesex run spree. "It's always good, a little bit closer to that first [Test], to get runs under your belt. The first innings, I got a start and you'd always like to go on. This innings I would've liked to go on a little bit more, but to get 70-odd under my belt is good for the confidence." Ponting's innings of 71 was a more authoritative affair, and was highlighted by a pulled six that disappeared over the grandstand and required a change of ball. His efforts contrasted sharply with those of his latter-innings partner, Marcus North, who required 22 balls to score his first run and struggled to adjust to the pace of the wicket. North survived a confident caught-behind appeal early in his innings, but was eventually removed by Rayner for a scratchy 11 to add to his solitary run in the first innings. His all-round versatility - particularly in the spin bowling department - should ensure he retains his place in the Australian XI for now, but many more performances like this, and Shane Watson could soon be beating down his door, fitness permitting. "That's just how it panned out in this game," Hughes said of North. "There's still another practice game. He'll be right." The turn of Rayner and Beer, a 20-year-old wrist-spinner with just two first class games to his credit, also accounted for Michael Hussey, Brad Haddin and Brett Lee. A dashing, unbeaten 75 from Clarke late in the day may have spared their blushes, but the Australians will be acutely aware that better execution to spinners is required if this is to be a summer of triumph. "It's a slow wicket out there," Hughes said. "It's a third-day wicket, it's worn and torn a bit, and as the ball gets older the wicket definitely slows down. You have to look at these different conditions that we're playing in over here and sum them up. There was a bit of rough there and it was good to face (Rayner) in these conditions. It was definitely turning a bit out there."